Whether you’re planning on roasting a turkey for American Thanksgiving, Christmas dinner or New Year’s Day, you can always use a few helpful tips to make it the best it can be. Since roasting a gargantuan bird is not on the usual M-F menu plan, it can cause even the most experienced cook to hesitate before proceeding. Fortunately, I know my tips and tutorial can boost your confidence for preparing your event’s main attraction. You may be wondering what a relatively young lady such as myself could have to add to everything that has already been said about turkey, and you would be right to wonder. After all, how many Thanksgivings have I been cooking? Not nearly as many as some experts out there…right? But here’s the thing, I’ve been to Turkey Boot Camp. When I was nineteen, I had the privilege(?) misfortune(?) – honestly, it was a mix of both – of working a summer at a remote fly-in fishing resort on the Pacific Ocean. Another fellow and I were the chefs for the camp, cranking out three square meals for over forty people. Every three days, a couple of float planes would fly in carrying a new group of clients – and a frozen turkey. Along with the requisite pancake breakfast, shrimp bisque lunch, and other culinary highlights, we were obliged to prepare a well-rounded turkey dinner for each group of guests. Two groups per week, eleven weeks of work. Yes, that’s right, in the span of one summer, we cooked twenty-two turkeys! If that doesn’t make me qualified to talk turkey, then I don’t know what does. Read on for the full tutorial and printable recipe. My roast turkey is one thing: simple. It is un-stuffed and un-trussed. I don’t brine or baste. I keep my cooking time shorter than most, but lengthen the resting period. The result is a perfectly golden, moist turkey that is relatively hassle-free. Here are my tips for the best roast turkey, and the full recipe follows below. ~ Avoid cramming the bird into an overly small pan; you’ll only end up with over-browning on top and more braising than roasting, as the turkey stews in it’s own juices. ~ If you cook your turkey from room temperature, un-trussed and un-stuffed, it will cook significantly faster than a chilly bird stuffed full of bread and trussed tightly. ~ Remember, oven temperatures can vary drastically, so even if the turkey has been in the oven for an appropriate time, it is still necessary to double-check for doneness. A meat thermometer should register 170°F when inserted into the thickest part of the thigh (but not touching the bone). You can also follow the directions from this post on Roasting Chicken 101 on how to tell when your roast poultry is finished. ~ Loosely cover the turkey with aluminum foil if it looks like the top is browning too quickly. I also rotate the pan 180° every hour for even browning in my old oven. ~If you’re worried that the bird is slightly underdone, remember that it will keep cooking during the resting period. 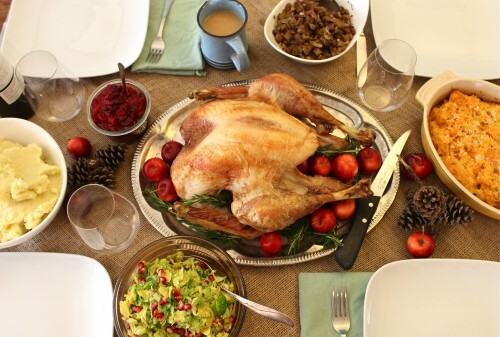 A well-rested roast turkey is a moist roast turkey, so this step is crucial. Remove fresh turkey from any packaging and snip free of any string or trussing. Remove neck and giblets from the body cavity, reserving for stock, if desired. Rinse turkey well under cold water and pat dry with paper towel. With a sharp knife, remove the wing tips (up to the first joint) and add those to the stock pot too. Place turkey on a tray or pan and sprinkle the sea salt all over. Leave uncovered in the fridge overnight. This will allow the bird's skin to dry out, making it crispier, plus the salt will add flavour to the meat without the hassle of a wet brine. Remove turkey from the fridge. Rub a softened stick of butter ALL over the outside of the bird. Coating the skin with butter will help to keep the meat moist, add flavour, and ensure the skin turns a perfect golden brown colour. 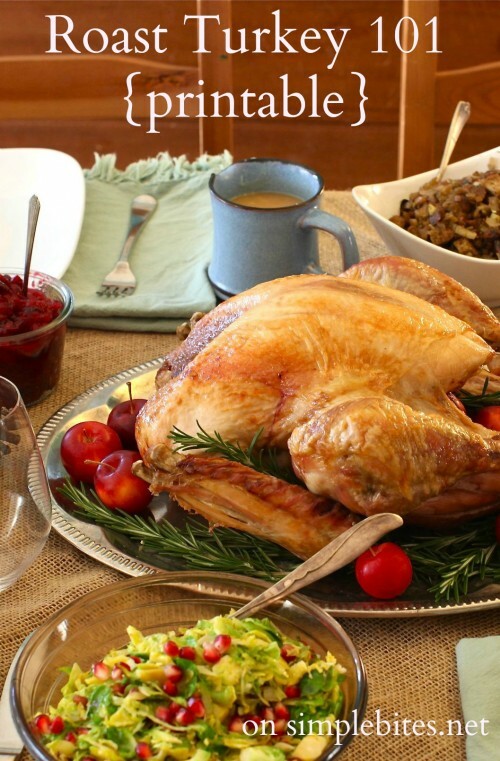 Place the turkey on a wire rack in a large, shallow roasting pan. Elevating the turkey allows for the heat to get all around and also for the skin to crisp properly. Leave the turkey on the counter and allow it to come to room temperature. If you cook your turkey from room temperature, un-trussed and un-stuffed, it will cook significantly faster than a chilly bird stuffed full of bread and trussed tightly. Air will circulate much better around the bird and roasting times will be shorter. Oven temperatures can vary drastically, so even if the turkey has been in the oven for the appropriate time, it is still necessary to double-check for doneness. A meat thermometer should register 170°F when inserted into the thickest part of the thigh (but not touching the bone). Remove the turkey from the oven, tent it loosely with foil and let it rest for at least thirty minutes (and up to an hour). This resting time will allow the cooking juices to be re-absorbed by the meat instead of losing the moisture as soon as the turkey is sliced into. If you use the pan juices for gravy, just transfer the turkey to a platter to continue resting, and make the gravy in the roasting pan. 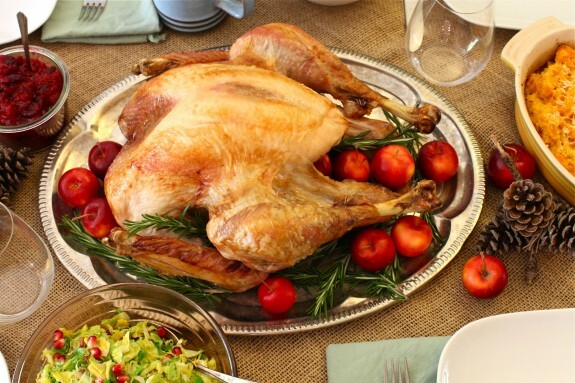 Place roast turkey on a serving platter and garnish with fresh herbs, cranberries or crab apples if desired. Carve while still warm and serve with plenty of hot gravy. Are you on turkey duty for US Thanksgiving? Is a Christmas turkey in the plans? I am doing Thanksgiving this year, and I have only ever roasted one turkey…so I am a little concerned. But, I have roasted many chickens, so I figure it can’t be that different! I have read that you should cook it at 325, but I’m not sure what I am going to end up doing. It should be an experiment though! But, I think my family will be happy with it (it will just be my husband and kids this year! )…at least I hope. Aimee, you are a Thanksgiving dinner fairy godmother! Thanks for the printable version! 2. do the roasting time totals include the 20 min at 400 degrees, or are they just times for keeping at 350? Thanks so much! I do roast it breast side up, yes. Roasting times include the first 20 minutes at 400. Happy cooking! Such a beautiful turkey, Aimee! the ingredients list calls for 1 cup of butter. the directions read to rub with one stick (which would be 1/2 cup, right)? So is it rub with 2 sticks? That seems like a lot, I have an almost 12 lb turkey. I’m not on turkey duty this year – my dad is roasting the turkey outside on the grill – but I’m definitely bookmarking this for future reference. 22 Turkeys in a summer! Yes, I will gladly look to your expertise! By the way, these are such lovely photos – and I adore your pine cone decorations too. I am almost 50 years old and this will be the first turkey I have ever cooked for a crowd. Thanks for a simple tutorial. Bless you! Thank you SO MUCH for sharing all your turkey roasting experience. Indeed, I take 22 turkeys in one summer quite seriously and am happy to follow your lead. I’m not messing around with brining or anything fancy so I’m glad to hear your thoughts on that, and I was also wondering about letting the turkey come up to room temperature before roasting. I’m also relieved to hear that a longer rest at the end is actually a good thing since I’ll be transporting the beast to my mom’s house for dinner and carving it there. I can’t tell you how nice it is to see a normal turkey “how to” from a normal (albeit very turkey experienced) person instead of a fancy chef/restaurant owner who makes gourmet turkey dinners in their superkitchen. I’m definitely saving and reviewing this post for Thursday. Thanks again. Such great advice, Aimee. Love the no-nonsense approach. Hi! 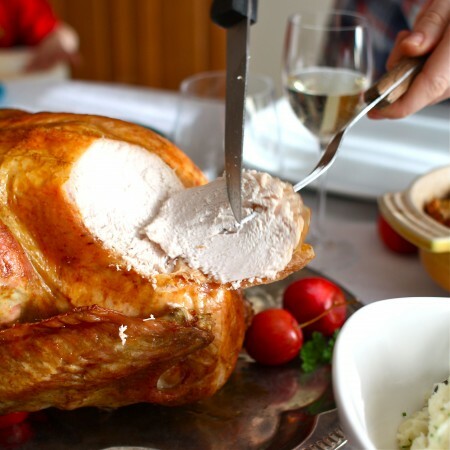 Quick question….do you baste your turkey during roasting? If it is not browning as quickly as I like, I sometimes brush it with butter, but otherwise, no. I looked for a gravy recipe around here but couldn’t find one. I’ve read so many different ones… Help Aimee!! Thanks for the great tips! I cook two 24lb. turkeys every year, and they always come out moist. I keep it simple just like you do, with the exception of basting after th first 2 hours. I love the simple lavor of just salt & pepper on the turkey. Yummy! Thanks for sharing your knowedge. I have a few questions. 1. I am cooking a 17lb turkey, do I need more that 1tbsp of salt to rub on it? It doesn’t seem like enough salt. 2. Is kosher salt okay to use instead of sea salt? Kosher salt is fine. And you can be generous. Use an extra teaspoon or so if you need it. It’s not an exact science, like baking. Happy Thanksgiving!! Thank you for all the great pointers! One Question I have is a shallow roasting dish like a cookie sheet with a wire rack on top? If you have an actual roasting pan that the turkey fits in without being too squished, that is good. A cookie sheet could work, I suppose. Sounds fabulous. Quick question about the statement below: Do you tent the turkey on the rack in the roaster? If so, when the turkey is placed directly on a tray, where are the juices coming from that will be re-absorbed by the meat? I am a little confused…is this a two step process covered in #11 below? 11.Remove the turkey from the oven, tent it with foil and let it rest for at least thirty minutes (and up to an hour). Place the turkey directly on a tray (not on a rack), as this will allow the cooking juices to be re-absorbed by the meat instead of losing the moisture as soon as the turkey is sliced into. I am looking forward to trying this recipe beginning today. Sorry for the confusion and Happy Thanksgiving, Tracy! I used this recipe for our turkey today and it was WONDERFUL. Easily the best turkey I have ever made. I just tried this yesterday and it came out great- Thanks! Love how simple this is. I also love how you’ve linked to all of your side dishes. Great Thanksgiving post!! I have never done the turkey for Thanksgiving (I am 56) and wanted to this year. I have to tell you that this turkey was amazing. I did stuff the cavity with onions, lemon, carrots, celery and fresh thyme, rosemary and marjoram. I coated the whole turkey with olive oil, but put herbed butter under the skin on the breast and drums. We let it rest for over 1 hour because family was running late. It was soooooo moist and juicy–even the next day. I don’t care how old you are–you sure nailed this recipe. The cooking temp and times were spot on. I need to see if you have a recipe for prime rib. I want to make that for Christmas. Thanks Aimee for your contribution to cooking. Thank YOU, Joan, for stopping by and letting me know! I really appreciate it. So glad your Thanksgiving was delicious. Place seasonings and butter under the skin. It cannot soak through the skin to flavor. This has been my go to for every turkey dinner for the past few years. Thanks! Merry Christmas!